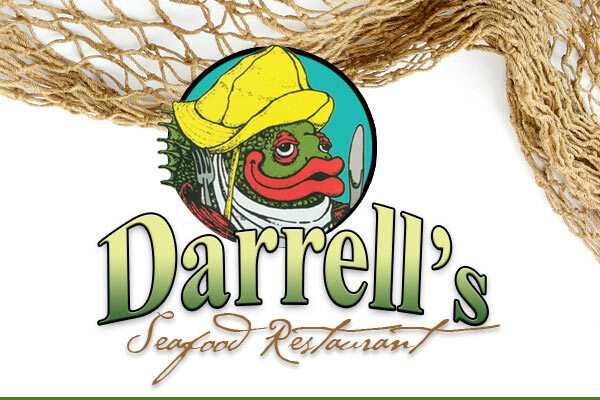 Darrell’s is a family-style seafood restaurant that’s been a favorite on Roanoke Island since 1960. Seafood is the definite specialty; the fried oysters are widely touted as the best anywhere, served with the traditional fixings of cole slaw, French fries and hush puppies. Locals know that Darrell’s does seafood right. Land food, children’s fare and light eaters’ dishes are also available. Helpings are heaping, and desserts are delicious, if you have room. Breakfast, lunch and dinner are served every day except Sunday. Served with home fries or grits and toast or a biscuit. Eggs served any style. Served with home fries or grits and toast or a biscuit. Open-faced biscuit smothered with scrambled cheese eggs and sausage with country gravy. Green peppers, tomatoes, onions, mushrooms, ham and cheese. Served with toast and grits or hash browns. Hatteras style. Clear broth with celery, potatoes, onions and fresh clams. Rich and creamy with fresh backfin crabmeat and a touch of sherry. Native NC shrimp hand breaded, fried and tossed with spicy Buffalo sauce and served with homemade ranch or bleu cheese. Native NC Shrimp hand breaded and fried. Oysters lightly breaded and served golden brown. Made daily with fresh local crabmeat. Served with your choice of homemade ranch or bleu cheese. Freshly cut, dipped in Darrell's own breader and served with homemade ranch. In-season. Perfectly cleaned and fried like only Darrell's does. Fried or broiled. Served with your choice of two vegetables. Chef's selection served with French fries, coleslaw and hushpuppies. Served with your choice of two vegetables. Crabcake, shrimp, popcorn shrimp, fish or oysters. Served with your choice of two vegetables. Local Gulfstream catch, marinated in zesty Italian dressing, lemon juice and soy sauce. Served with your choice of two vegetables. Fresh ground beef, grilled and served with onions and gravy. Served with your choice of two vegetables. In-season. Lump crabmeat served in butter. Served with your choice of two vegetables. Sweet tender shrimp breaded and fried in our kitchen. Freshly cut, dipped in Darrell's own breader. Two crabcakes made with fresh crabmeat. Served with your choice of two vegetables. Traditional NC style pork made in-house, chopped and tender. Made in-house using fresh crabmeat. All sandwiches served on a bun with potato chips, pickle and the usual fresh toppings. Substitute French fries for $1 extra. Thinly sliced Prime Rib with melted provolone cheese and served with au jus dipping sauce. All sandwiches served on a bun with potato chips, pickle and the usual fresh toppings. Substitute French fries for $1 extra. Oysters fried golden and piled on a soft bun. All sandwiches served on a bun with potato chips, pickle and the usual fresh toppings. Substitute French fries for $1 extra. Local flounder freshly fried. All sandwiches served on a bun with potato chips, pickle and the usual fresh toppings. Substitute French fries for $1 extra. In-season. All sandwiches served on a bun with potato chips, pickle and the usual fresh toppings. Substitute French fries for $1 extra. 8-oz. of beef freshly pattied. 8-oz. beef patty served on a bun with potato chips, pickle and the usual fresh toppings. Substitute French fries for $1 extra. Fresh from the Gulfstream. All sandwiches served on a bun with potato chips, pickle and the usual fresh toppings. Substitute French fries for $1 extra. All sandwiches served on a bun with potato chips, pickle and the usual fresh toppings. Substitute French fries for $1 extra. NC shrimp battered, fried and served on a bun. All sandwiches served on a bun with potato chips, pickle and the usual fresh toppings. Substitute French fries for $1 extra. A juicy chicken breast marinated in Italian dressing with smoky bacon and provolone cheese. All sandwiches served on a bun with potato chips, pickle and the usual fresh toppings. Substitute French fries for $1 extra. A juicy chicken breast marinated in Italian dressing. All sandwiches served on a bun with potato chips, pickle and the usual fresh toppings. Substitute French fries for $1 extra. Tender breast strips, hand-battered by us, southern fried golden and served on a soft bun. All sandwiches served on a bun with potato chips, pickle and the usual fresh toppings. Substitute French fries for $1 extra. Shrimp, scallops and fish of the day. Oysters, shrimp, scallops and fish of the day. With your choice of two sides: French fries, mashed potatoes, coleslaw, green beans, baked potato, apple sauce, pickled beets, homemade potato salad and vegetable of the day. Local Gulfstream catch, marinated in zesty Italian dressing, lemon juice and soy sauce. In-season. Lump crabmeat served in butter. Traditional NC-style pork, made here, chopped and tender. NC Pork BBQ, smoked daily on our wood-burning grill paired with our freshly made chicken strips. 8-oz. fresh ground beef, grilled and served with onions and gravy. Freshly hand-cut and grilled or country fried. We makes these here and fresh! Hand-cut breast tenders with our own special crispy coating, fried golden brown. A full 8-oz. breast too! Made with our own special marinade. Served with French fries and apple sauce. Homemade yellow cake topped with vanilla ice cream and hot fudge. Please give a one hour advanced notice for this item. Please give three hours advanced notice for this item. We have both vinegar-based sauce and red sauce.